Remember Aero the Acrobat? Awesome Possum? How about Wonderdog? The 16-bit era was flooded with such me-too mascots from a wide range of publishers, largely spurred on by the incredible success of Sonic and Mario. As is the case when a single idea takes over the market, there simply wasn't enough of an audience to make all of these characters successful, and many fell by the wayside pretty swiftly. However, some managed to cling on despite their questionable quality, and one such individual is Bubsy the Bobcat. Now to be fair, Bubsy's debut wasn't all that bad. Bubsy in Claws Encounters of the Furred Kind arrived on the SNES in 1993 and offered a viable alternative for those who had become bored of Sega and Nintendo's million-selling mascots. However, by the time the largely terrible Bubsy 3D: Furbitten Planet arrived on the PlayStation three years later, the bobcat had well and truly outstayed his welcome, and has been largely forgotten ever since. Until now, that is - our friends over at iretrogamer.com have put together a video which looks at the Bubsy series and reminds just how annoying the character was. Have a watch and let us know if it has rekindled any memories you'd rather have forgotten, or if you're a secret fan of the wise-cracking feline. Bubsy is very memorable among Sega fans. For all the wrong reasons, the games were freakin terrible, which is a shame because they looked fun. Until you started playing them. "The 16-bit Mascot Nobody Asked For" Lolwut? I want him to be in Smash and I liked his 3D game. I actually consider Bubsy 3D the best video game in the Bubsy series. I hope he'll get a new game someday. By the way: Bubsy > Sonic. Let the storm begin. I remember Aero was actually pretty good despite huge difficulty, though by the end of the game it turned into a Battletoads-level amount of non-platforming. They tried to bring him back by porting the first game to GBA but I think that port suffered from slippery controls and bad aspect ratio. couldn't see in the artical but they are actually re relicing the Bubsy 1 and 2 games on steam in Greenlight. I remember hugely anticipating Cool Spot and being really let down within minutes of starting it.it looked good,reviewed not bad but I hated it. Every console generation has had its genre gluts where a given type of game was oversaturated. Horizontal and vertically-scrolling Space Shoot-em-ups, or "Schmups" were all over the place on the NES and Master System and especially the Genesis and SNES (among the most memorable: the ThunderForce series, Gaiares, Axelay, Silpheed, and M.U.S.H.A.). Then of course came the 2D platformers including Mario, Sonic, and a host of knock-offs including Bubsy. Today's genre glut is easier than ever to spot: first and third-person shooters and sandbox games where you sneak up, kill, and repeat ad nauseam; literally SIX of Ubisoft's games at this past E3 could have had their characters and titles swapped out and nobody would have known the difference. So believe me when I say that Bubsy has plenty of company in the "Me too" department. As for the game itself, it wasn't horrible but frankly not that memorable, either. My favorite part of the entire game (SNES version) was the music in the level with the mountains and log flumes. But the controls could be wonky and it didn't take long for Bubsy's charm to wear off. Bubsy 3D was bad, even for 1996. Unfortunately it was being compared to Mario 64. What I remember is you basically controlled the camera - whatever direction the camera was centered on was the direction bubsy jumped, so it felt very rigid. Apparently, Bubsy is trying to get a Rerelease on steam Greenlight. The stuff of nightmares if you ask me. As a kid I didn't have much of a standard but I remember playing some Bubsy game with my uncle on his Atari Jaguar (!) and realising that a videogame can also be bad. Really bad. That was a first. I remember when Bubsy came out back in the day. There was advertisement everywhere for this game! But I bravely resisted, and apparently I made the right decision. I remember renting the first game on SNES as a kid and liking it, but that was now over 20 years ago and I'm not sure the last time I've ever touched it since i don't own it and it is not on VC. I would like to see him back for a small download game or something. I'd laugh if I saw him in Smash. I'd at least recognize him unlike Cloud. I loved the original Bubsy! I went over to my grandparents and played it with them all the time. I would try to run through and beat the levels while they would try amd collect all of the yarn balls. But to say that the original was the best game of the series is an understatement. It went all downhill from there. And I'm talking about a Bubsy jump off the side of a mountain and you can't slow yourself down with your glide kinda downhill. By if there was one thing Bubsy had going for it was the levels design. I especially loved the space and train/desert levels. But honestly looking back, there were far too many leaps of faiths in the game, or hidden enemies above your head. I can see why people hate it. @KingMike Aero the Acrobat was very strange and its controls weren't very good if I remember, or maybe I just sucked at it. Now if we wanna talk about cool 16 bit wannabe mascots, how about Pocky and Rocky, Sparkster the possum with the jetpack and Earthworm Jim? Those are fun games! I think I rented it once, must not been good though since I don't even remember any of it. Basically what happens when you think of the brand before the content. Oh yes bubsy.. The kat with the stupid puns being shoved into everything. I dont even know why we should ever remember such a tragedy ? Lets face it, Bubsy was a cash grap attempt to ride on the mascot wave set of by Mario and Sonic and it failed miserably. Lets all be glad that this cat didnt have nine lifes. Well-marketed crap from my childhood. "Remember Battlefield? Battlefront? How about Rainbow Six? The HD era was flooded with such me-too first-person shooters from a wide range of publishers, largely spurred on by the incredible success of Call of Duty and Half-Life." Myself, I'd take mascot platformers, thank you very much. There are a ton of 16 bit platformers I'd love to play on my Wii U gamepad......Bubsy is one I could do without. Still I like plenty of games most people consider horrible so maybe Bubsy will find his way back onto a TV screen again. Bubsy was a game I really really wanted when it first came out. I adored Sonic, and while it didn't look quite as good, it looked similar, and if I recall correctly it scored pretty well in CVG. I finally got to play it at a friends house and was thrilled that I hadn't spent money on it. It was so disappointing. Sparkster (or 'Rocket Knight' for Sega Genesis fans) is definitely an underrated series. The eShop should heavily consider getting those games on there. The boss battles were very difficult, but can be easier with the VC restore points. Hope you got to enjoy the 'Rocket Knight' remake that came out as a downloadable game for Steam, Xbox 360 or PS3 in 2010. @MrMario02 Oh yeah. When I saw that on the gaming news, I was like "How are people going to react to this?" Then the first that came through my mind was "At least is nothing compared to the abominations that were Sonic '06, Sonic Boom (for WiiU), Sonic Free Riders, and Bubsy 3D." Besides, Retroism (the company that has the rights to Bubsy nowadays) is releasing the first two Bubsy games, and not the God-awful 3D sequel for PS1, on Steam. And who knows? Maybe with their technology, they can try and put as many bugfix patches and extra level expansions for the two games for all I care. Then maybe, just maybe, they can make the Bubsy games bearable. @shredmeister I didn't even know it was brought back! I imagine a sad little corner of Wreck-It Ralph's world where Bubsy is the president of the bad mascot club. Right there with Cool Spot, 'Noid, Aero and all the other '90 mascots that came straight from 5th circle of marketing hell. Well, to be fair, nobody asked for any of the mascots. If his game(s) had been great then we'd probably all have fond memories of him. Instead, his games were just okay, and sometimes even bad. So no one really remembers him or cares. I loved Bubsy. Bubsy 2 wasn't so good, but the first remains very memorable to me. My only criticism of it was that it was too hard, but then I was and remain a noob. Lol, I remember Bubsy. I played the first game on SNES, and the second one on Sega. Never did play the 3D game though. I actually want to play them now lol. My father got me Bubsy 3D for PS when I was a little. All I remember now are those eye hurting chessboard patterns on ground, bad music, weird 2 heads aliens and overwhelming confusion - where the heck I should go?! And I think I even managed to perform a glitch. But because I was young and fresh to video games I didn't even feel the game was bad, haha. I have nothing but fond memories of Aero. The only good thing that ever came out of Bubsy is JonTron's review. Just watch the Jontron video about it. As a younger man I entered a Bubsy competition in Super Play and won. 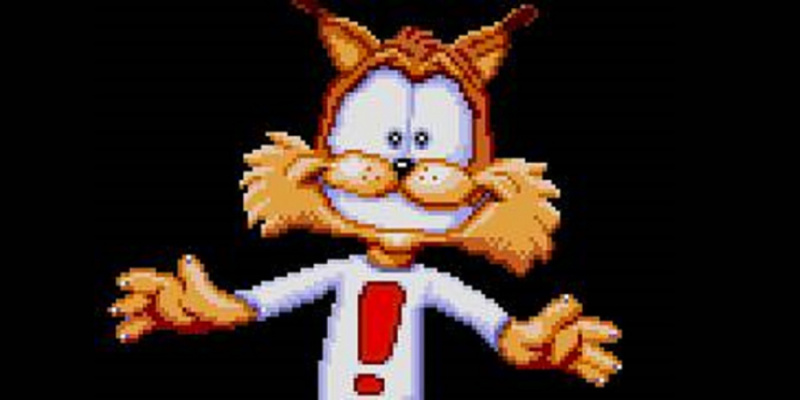 You had to come up with an anagram of Bubsy the Bob Cat, I submitted Seat butch Bobby and won first prize of a long -sleeved Bubsy logo T shirt, an exclamation mark with a yarn ball as its dot, but not a copy of the game! I first learned about Bubsy from a episode of Jon Tron. Still never played any of the games myself..but honestly they don't look like something I WANT to play. I had Bubsy on the SNES and I loved it. For years I had this memory of an enjoyable 2D platformer with catchy music, nice graphics and humourous death animations. Years later I went back and realised how blinded I had been by nostalgia. Whilst not awful in my opnion, the physics of that game were seriously messed up from the fall damage, floatiness and insane running speeds combined with one hit deaths. No wonder they made them funny to watch! I remember watching kids play Bubsy on the kids game show Amazing as part of the scorte erning challenge. Then about 5 years ago when I found an SNES in a garage sale, it ewas one of the games included. I only remember the first game, it was a generic platformer that did nothing to the genre it wasn't super bad but it was bland and forgettable like ZOOL and what not. This got me thinking, Disney got the while cash-in games nailed in the 90's most games based on disney animations were pretty good to great, looking at you Lion king and megadrive/pc Aladdin! Rob Paulson only voiced Bubsy II and the cartoon pilot. I believe each Bubsy video game used a different VO actor. "What can possibly go wrong?!" Man, I loved Bubsy (the game) and the music was awesome. I'm quite surprised that many of you hate the game. I had thought (at the time) that it was a popular platformer, but I guess I was wrong. I'd definitely get it on Steam when it comes out. Don't forget that Bubsy Two-Fur is on Steam Greenlight, because people were hankering for Bubsy so much that we need ports of the first two games for PC. Seriously what were they thinking, nobody wanted Bubsy then and nobody wants Bubsy now. I'm one of the true Bubsy fans. I've loved Bubsy ever since I was a kid and played it. I love the first game, I found the second game mostly enjoyable, and I love Bubsy as a character. I have never tried Fractured Furry Tails or Bubsy 3D, though. I don't understand the complaint that people have about fall damage. If you glide, you don't get hurt from heights. Sure gliding is harder to control, but it just takes practice. @SMW At the time, I think Bubsy 3D just came across like a Mario 64 rip-off that paled in comparison. Not knowing the development cycle in 1996, the public was naive and that general perception was created. They should reboot it on PS4 with the best graphics possible. That's what he deserves. There was a lot of mascot games in the 16 bit era that have long been forgotten...some were great, some were not. To name a few...Bubsy, Aero the Acrobat, Chuck Rock, James Pond, Zool, Cool Spot (still love the old 7-up commercials), Chester Cheetah, Taz and even Battletoads. They even went into the 64bit era with some good ones...Glover, Chameleon Twist, Rocket, Mischief Makers and more. Some of these need to be brought back, even if they're just re-released as game store games for cheap prices. It would be nice to feel the love of them again, but until then, glad I still have my older consoles to play them on!!! I played Bubsy 2 a few years after it came out. It was...depressing. He's still a cooler looking mascot than Ratchet & clank. I loooved the first Bubsy game, but I have never played the others. I wish I could download it on the Wii u, but that won't happen sadly! The Bubsy cartoon doesn't look bad, from what little was shown here. I can't speak for other gamers, but I find that less is more when it comes to voice samples in games. I still prefer fun sound effects and pleasant music to speech. The problem with a lot of these bandwagon, mascot games is what they were up against. Sonic and Mario were both in excellent games from Japanese developers that had a knack for designing their games to maximize fun. Western-developed games, like I believe Bubsy is, didn't hold up as well. There are those that defend Bubsy, but there are very few who claim it matches the quality of Nintendo or Sega's best. Not bad was not good enough to last. So is he still going on Satpurrday night live? @whodatninja Jontron did it fffffffffffffirst! Bubsy on SNES was great! I didn't even know they made more Bubsy games after that.